When asked why he spent so much money on cars Jay Leno once said he had more money than brains. I can relate in a way although not anywhere near the same monetary level as Jay. After several years and three different version of my Datsun 280Z I have done about all I intend to do to the car. Don't get me wrong I love the Z and will continue to drive and show it. 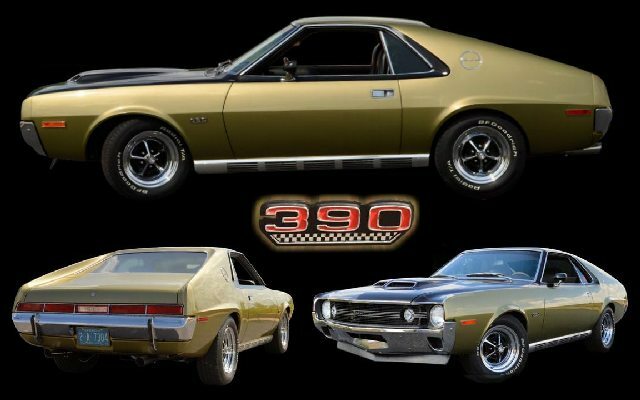 But there as always been a spot in my heart for the 1970 AMX I bought new and reluctantly sold in 1979. I am now at a place in my life that allows me to be a little more extravagant with my desire for toys. 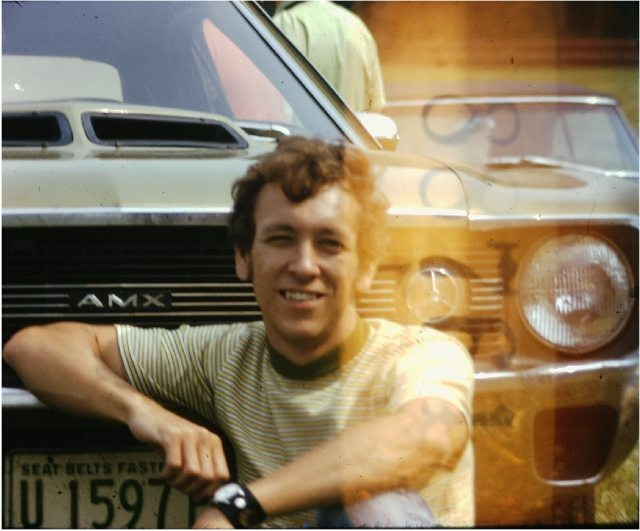 The picture below is me in front of my original 1970 AMX. Man , I was so young. LOL. So a few months ago I started the search for a 1970 AMX. It seems suddenly the 1970 version of this car has gotten very popular and the price as started to rise. I found some fully restored but were out of my price range and I really want to do some of the work myself anyway. At the other end of the spectrum were some total beater cars which would require major body work, way past my abilities. At last I found one in the middle. It is somewhat of a survivor car. Numbers matching 390 with the original golden lime metallic paint my car had. It also has the shadow mask paint scheme which gets you the black hood and stripes. The interior is in pretty poor condition, but that's alright since it is tan and I really want a black interior anyway. The car is an automatic, I would have preferred a 4 speed. Maybe I will change it but maybe not, we'll see. It does have AC, certainly a plus living in Georgia. The car was purchased from The Burt Collection in Chicago. It was listed on EBay with no reserve. I Emailed them to see if I could buy it without dealing with the auction, I had lost a few cars at the very end of the auction. They said make them an offer, I did and they accepted it, maybe I should have offered less, LOL. I sent them a deposit and after a few days called them to arrange the final payment. They mentioned right after I sent the deposit they had an offer at $4000 more than I paid so maybe I did alright. I am looking forward to getting the car and beginning the restoration. I have spent an inordinate amount of time searching for anything I can learn about the 1970 AMX. Parts are rare and not cheap, but most are available. Assuming there are no major driveline issues I will probably start the restoration with the interior. Fortunately the interior is available from Legendary Interiors. Its been a few weeks but Peter from The Burt Collection Emailed me to inform me the car had been picked up by the transporters on June 6th. Sunday night, the 10th, the transporter called to tell me they would be here at 8:00 in the morning! Yikes, some warning would have been nice. He also told me the ignition key was broken off in the lock, no trunk key and there was a locking gas cap with no key. And the car seems to be out of gas. An ominous start to this restoration, LOL. But hey, I did not expect a 43 year old car to arrive without some issues. I managed to break the lock on the gas cap, put some gas in, squirted some starter fluid in the carb and it roared to life. Thanks goodness we didn't have to attempt to push that thing up the driveway. The first thing I noticed when the car was still on the carrier was the California plate on the back. It expired in March of 11. The original dealer window sticker was in the glove box, that car started life in Kenosha Wisconson and was first sold in San Leandro, California. which is a suburb of Oakland. There are certainly 43 year old issues with the car. The seat upholstery is trashed, the backs are missing and the sliders are frozen and there is no headliner, mirror or sunvisors. Much of the weather stipping will need replaced. While the dash pad is NOT warpped, very unusual for an AMX, it is brown, to match the interior. The door panels are in decent shape but they too of course are brown. Even the carpet is in usable shape for a 43 year old car, just the wrong color. The entire interior has the smell of an old car. No problem, I knew I would be replacing everything in there anyway. There were some suprises in the engine compartment. The engine does not appear to be the original or at least it has been worked on. The intake is an aluminum Edelbrock Performer dual-plane, low-rise design and the carb is a 80457-2 600cfm Holley . There are long tube headers, a Mallory Unilite distributor which has an optical pickup which mean NO POINTS and a Mallory coil. The plug wire have some sort of metal jacket on them, never seen anything like them. The fuel pump could be stock but it is connected to the carb with AN fittings. There seems to be a leak around the fuel pump, I will have to investigate that quickly. All the bolts used on the engine are torqs type. The EBay ad for this car said the glass was excellent. Well most of it is, but the windshield is cracked. I talked to Peter at The Burt Collection and he is going to try to get the go ahead to have them pay to get it replaced. The cost looks like around $300 from Safelight. However there are issues of greater concerned. I already knew the wiper switch was missing but now I see the mechanicals on the wipers is broken, or maybe just disconnected. Unfortunately the cowl on this car does not come off so I guess you have to pull the wiper motor the work on this problem, that should be fun! But bigger than that is the lights don't work, no parking lights, no turn signals no tail lights, no brake lights. That seems like it should be an easy fix, like a fuse, lets hope so. I still have no keys for this thing. They seemed to have disappeared but the hunt is on, LOL. I pulled back the carpet to see if I could get to the trunk release and saw the stock wheels as promised which I was able to pull out through the interior. I got the trunk opened and found along with the wheels and beauty rings the stock exhaust manifolds, the AC compressor and some unknown bracket sort of hinge thing. I pulled the lock so I can at least close and open the trunk. Since I have no title yet, that must be at the same place the keys are, I can't get the car registered and drive it. No huge deal, a little frustrating but with the light issue its not drivable anyway. So I have decided to just start the restoration. Its been a month since I took possession of the AMX and I have realized a few things. Number one is that once again I paid too much for a car. It certainly isn't anywhere near the condition that was advertised. But ya know, "let the buyer beware". That's what I get for not checking it out in person, I am just too trusting. Number two is things are taking me much longer than I thought. But that is mainly because every time I change something I find something else that needs fixing or upgrading. But this is a 42 year old car and I bought it as a project, I certainly got that! I still have not really driven the car any distance so I don't know if there are any major problems with the engine, transmission or suspension. I think I have all the electrical issues fixed or identified and have started to put some stuff back on the car. I know I will feel much better after I get the interior recovered and back in the car. But given everything I am glad I got it. Each time I do something on the car I think about 1970-1979 when I was cruising the roads of Ohio thinking I was king of the road. Oh yeah, the glory days!!! Month two and I have made some steady progress, in fact I am about ready for the shake down cruise. I got the seats and door panels recovered and installed and the dash is back in. The interior is about as far as I can get until I have the headliner and carpet installed. All the electrical issues are fixed except changing over the fuse block which I will take care of later. The quarter glass is back in and some of the interior trim.So now its on to the mechanics. I hope I have better luck with that than I did with the electrical problems. One good thing, after two solid weeks of daily non-responded Emails to The Burt Collection they finally sent me the money for the windshield. Amazing!!!! Another month, number three, has passed and things have progressed, but again not as quickly as I hoped. A couple unforeseen things once again delayed the first drive. As stated in last months update I thought I was ready to go but it turns out the alternator was toast. I converted to a much more reliable GM 12SI unit. Then I discovered a leak in the transmission cooler lines that took me two weeks to get new lines and an external cooler installed. After that was fixed again I thought I was good to go, but NO-O-O! Now the pan gasket is leaking. It took a couple days a several parts stores to get the proper gasket. But at long last I was able to take it out for a couple short runs. Compared to my Z it doesn't handle all that well and the power is no where near the Z. I think some tuning with the carb and some other tweaks it will improve. The ride is good especially considering its age. It appears the suspension and brakes have been recently gone through. Month number four and the car is on the road finally. I made the first real trip a few weeks ago and of course discovered a few problems. Nothing major, some rattles, a heater control problem and a security lever on the steering column that isn't hooked up. But it started without incident, road smoothly, handled and stopped well. The transmission leaking is thankfully a thing of the past. However on my second road trip one of the front calipers locked up after a harder than usual stop causing the brake to get very hot and the car to pull to the left badly. But we were able to fix that quickly. The 70's seatbelt and shoulder harness setup was a PITA then and certainly is now. So I got new seatbelts to replace the brown old ugly and hard to hook up originals. I added some VDO gauges to monitor voltage, oil pressure and water temp. These were installed where the old AM radio was. For audio I added a Secret Audio unit. Its pretty cool, the unit sits in the trunk and has hook ups for everything you could possibly want. I will use the USB input to store music on a USB memory stick. Fatmat heat and sound insulation has been added. I took the car back to Kenny Stevens to have him look into the missing headliner and carpet replacement. Month five and more issues have popped up but the car is getting better. The locked up brake issue was not solved as easily as I thought. On the next long drive it locked again. This time I replaced both front calipers and mounted them in the correct orientation so the bleeders were at the up position, they were on the wrong sides before. The headliner and carpet have been installed so the interior looks like a real car now and the car is much quieter inside. A couple upgrades evolving a new steering wheel and a trunk wall to clean up the speaker and audio unit area have been done. The next hurdles are getting the dents in the front fender taken care of and fixing the wipers and the heater, neither of which work. It sure doesn't seem like it but its been six months. Progress was good this month. The fender dents have been removed. I made some front speaker enclosures which I located over the front kick panels. The rest of the interior panels have finally been put back in. The door sills have been polished and I painted the four silver bars on the grille the PO had removed and exchanged the silver headlight bezel screws for black ones. I picked up a Group 19 front spoiler and installed it adding a more racy look to the front. But I have yet to address the wipers and heater issue. Month seven has arrived, the Mayan Indians were wrong and the world did not end! The holidays put much of the work on the slow track this month. But I have picked up a few things for the car. I swapped out the stock valve covers for some Edlebrock black finned aluminum ones, just to dress up the engine a little. While I was in the engine bay I also swapped out the mechanical radiator fan for a duel Spal electric fan setup. After some intense trouble shooting and advise fro the AMC message board I finally got the tachometer to work. Seems the wiring was all wrong. With the tachometer working it appears the rear gear ratio is 3.54:1, a little deeper than I thought it would be. Eight months into the project and things have slowed to a crawl. I have ordered some drop plates to lower the front suspension to give the car a more aggressive stance. I have installed 1" wheel adapters to the rear to bring the rear wheels out close to the front width. I swapped out the old spark plug wires for some new red Taylor wires. I sold several things I pulled off the car, got a decent price which will help offset some of these upgrades. Started collecting parts to swap out the headers in favor of AMC factory free flow manifolds. I installed the drop spindle plates and the car looks awesome. I ran into a couple weird things but it was a pretty easy install. Unfortunately these push the wheels out 3/8" on each side and with my wheel and tire combination I had some interference with the fender on the passenger side. I rolled the fender lips and that seems to have fixed the problem. But I am looking into some custom steering knuckles so I can eliminate the plates. The other issue is the headers that already had ground clearance issues are obviously worse now, they gotta go. I finally got my heater to work. A small problem at the fuse block caused by me was the culprit. I made a truck mounted tool box to hold my jack and some tools. Since lowering the car made my headers hit even worse I have pulled them off and swapped in some later "free flow" manifolds. I setup an appointment with the exhaust shop next week to connect the manifolds to the mufflers. The muffler shop hooked up my freeflow manifolds to the existing mufflers so at least now I won't be hitting every little bump in the road! To help the '70s handling I picked up Larry Mitchell Gymkhana Suspension front and rear sway bars and a set of KYB gas-adjust shocks. I have installed the front bar and shocks. I also got the rear shocks swapped out, but not the rear sway bar yet. Well its been a year since I got the car. I have accomplished a lot over these past 12 months. There are still some unresolved issues but nothing I can't live with. The oil leak which I thought was the rear seal looks like it was loose oil pan bolts, at least I hope so. But the engine is running fine. I have started accumulating parts to fix my wipers, seems I am missing 5 parts! I started attempting to "fix" the shadow mask paint but so far its not looking good, a repaint maybe in the future. I have gotten the windows tinted and it look awesome. I have upgraded the radiator to a 3 core aluminum one, it has made a difference. I had some stock steering knuckles modified to achieve the same 1 5/8" drop as the lowering plates without adding the extra track width. My design had one minor flaw, I sort of forgot one modification and there were a few suspension part to replace, but I got them on. With the help of my buddy Gregg I got the rear sway bar on. I did some sanding on the hood to remove the massive imperfections in the paint. Its better but its still not what I want. Its been a lazy month. I spent most of this month just enjoying the car. I finally got all the pieces to install the wipers, but still haven't installed it. I made modifications to my front spoiler widening it and adding side sections to wrap under the front fenders. I finally managed to get the wiper motor installed, nice to have the option to drive without fear of rain. I fixed some issues with my exhaust which involed new mufflers and tail pipes. For some added bling for the engine bay I got a Tuff Stuff polished alternator. I attended the AMO regional show in Atlanta on the 5th. Man, there was a lot of nice AMC cars there. I scored some amber turn signal lenses to replace my clear ones. I had my muffler shop swap out the old mufflers and tail pipes. I got rid of the ignition coil on top of the engine in favor of a Mallory Promaster E. Shiny stuff! I know its just for looks but I like that look and if I am upgrading stuff why not have it look as good as possible. In that effort I added some polished stainless fender braces and a chrome master cylinder cover. I made a new bracket for Tuff Stuff Alternator using a turnbuckle for better and easier adjustment. I will probably have that chromed at some point. To add some chassis stiffness and cool factor I made a front shock towers brace. It involved modifying the shock tower mounts with a bracket the hold the 7/8" aluminum brace that runs in front of the carburetor. I have updated my crank and water pump pulleys to CVF Racing billet aluminum ones. I got the new alternator bracket back from the chrome shop and installed that. In an effort to improve the power steering feel on the car I switched from the stock Eaton pump to the newer Saginaw pump and used shims to adjust the pressure to 750 psi. To mount it I got a stock polished bracket and a polished aluminum pulley. I have finally addressed the fuel leak I've had when starting the car. I changed the stainless lines with a combination hard lines and hoses. I upgraded the Ram Air system using a seal on the air cleaner pan rather than the one on the hood. I also had some polished stainless grille supports made by the same people that made the stainless fender braces. I did some modifications to the Ram Air seal using a Camaro gasket attached to the air cleaner pan. I swapped out the rear tires for 235x60-15's to give the rear a more aggressive look. The car has been off the road this whole month while I do some major rear axle assembly work. I have decided to swap out the stock two piece axles for Moser one piece ones. While I have this all torn apart I am getting new rear leaf springs and adding rear disc brakes. After way too much time the rear end conversion is near completion. I have the new leaf springs installed as well as the Moser axles and the sway bar mounts welded to the axle tubes. The disc brake conversion is near completion. With the rear end work done, except for adjusting the torque links, and the car finally back on the road I should turn my attention to projects that somehow got put on hold. Like install the new dash overlay and addressed some electrical gremlins. But I have decided to change the front disc brakes to a newer more modern setup so the car is off the road�..AGAIN! I can�t believe I have had this car for two years. I have made many fixes and upgrades and am pleased where the car is today. The latest upgrade was converting the front discs to a Wilwood four piston setup. I still have some projects to get to and some upgrades I would like to do. We�ll see what this next year brings. At long last I have brakes I am confident in with the Mustang rear discs and Wilwood setup out front . The car stops like it never did before and that scary brake pedal to the floor thing is gone. I installed the final piece this month, a Lokar universal e-brake cable kit. The only disappointing thing is after all this work and expense it is all hidden behind the Magnum 500 wheels. So unless I point it out nobody will know I have four wheel upgraded disc brakes. Do I see new wheels in the future? Maybe but probably not in the near future. There is not much left to do as far as upgrades unless I decide to change the transmission to an overdrive unit and swap the carb for EFI. Those two projects are still being debated. I added a passenger side mirror and a stainless upper radiator hose. Started work on the trashed shadow mask repaint. Work on the shadow mask paint has been slow. Instead of simply over painting I decided to take it all the way to bare metal. I will be using single stage hot rod satin black for this. I finally finished the work on the shadow mask paint. I made an addition to the console to house two cup holders. It�s been almost a year, the car has presented no problems and I haven�t done any changes to it. The highlight of the year is being selected for the �July Car Of The Month� at our Georgia Street Rod Association July meeting, pretty cool. In late August we had our annual picnic where the �Car Of The Month� for the year are presented. Getting to the picnic was a nice drive through the Georgia country side taking almost two hours. This was by far the longest trip I have taken in the car. It went without issues. The following week while coming home for a cruise-in I slightly kicked it a bit getting on the 4 lane and it started missing. By the end of that week it was missing much worse. So I decided to do some debugging and started with pulling the spark plugs. They did not look good! Four of them were badly fouled and number eight had a white build up on the electrode. They were NKG GR4 V-Power whatever that is. They were gapped at .035. I am running a Mallory ignition with a Mallory high voltage coil and I believe the gap should be .045. I also measured the ohms of the plug wires which are new and they looked fine. I picked up a set of Autolite 66 plugs, gapped them at .045 and the miss is gone. But the white stuff on number eight really bothers me. I�ll put a few mile on the car before pulling the plugs again to see if the fouling is starting again. Absolutely nothing has happened to the AMX other than enjoying driving it. But after seeing the fuel pressure in my new ride (Chevy truck) sitting at close to 10 PSI I decided to put a fuel regulator on the AMX too. I made a bracket which mounts to the front driver side frame rail to hold a new better fuel filter, the regulator, and a pressure gauge. I attached an AN braided hose to the input side of the filter and ran it to an adapter on the hard line coming off the fuel pump. I used an AN braided hose from the regulator output to a new AN banjo fitting at the carburetor. I went out for a short ride Sunday but after about 10 minutes I felt the engine missing a bit. I stopped at a light and the engine died and would not restart. After many attempts I held the carb wide open and it eventually started but immediately died at idle. Long story short, I managed to limp it home. I pulled the plugs which were all covered in black soot indicating way too rich or really bad spark. I put in new plugs, it fired right up, sat at idle for about 30 seconds, started running really bad and then shut off. After talking about this on the AMC message board and seeing the plugs were wet when the engine died I have concluded the carb is messed up somehow. I removed the float bowl sight plug and fuel poured out, that�s not right! This is indicating the needle wasn�t closing. So I removed the sight plug and the adjustment thing on top of the float bowl, rocked the car back and forth to get as much fuel out of the bowl as possible (clue from YouTube). Then put back the adjustment thing and turned it in pretty far. I started the car and it started right up and idled great. I spent some time trying to set the float correctly but so far it is still a little low. No clue why that fixed anything other than maybe crap was caught in seat and taking the adjuster out freed it. I�m a little concerned if that is true where the crap is now! I know better than to declare victory too soon but the engine is running fine now, at least at idle.